Salmon works beautifully made a day ahead and served at room temperature. For a bit of green, top with fennel fronds, carrot tops, or chervil. Slices of citrusy lemon and a bed of fragrant fresh thyme lends wonderful flavor to the fish. Ask your fishmonger to remove the long pin bones from the fish--coho, sockeye, or king salmon are good choices. We were amazed by the incredibly moist, succulent texture this technique creates. Ask at the fish counter for a cut from the center or top rather than the tail end so that the fillet has the same thickness throughout. This will ensure even cooking. Bok choy, also known as Chinese cabbage, is chock-ful of vitamins and minerals. It is well known for its anticancer properties so pairing this cruciferous vegetable with salmon gives it a double punch of nutrition. The salmon takes almost no time to cook, so prep the radishes and rosemary before the fish goes in the pan. If your backyard rosemary is blooming, sprinkle on a few blossoms before serving. One serving of this tasty fresh fish salad packs in a full day's worth of omega-3 fatty acids. Garam masala, a warm Indian spice blend, makes a simple rub for fish, chicken, pork, or lamb. Serve the salmon with steamed snow peas and precooked jasmine rice. We couldn't get over how delicious and silky-rich this salmon is, or how foolproof the recipe is. Don't be thrown off by the total time it requires: Think of it instead as a great make-ahead dish, where all you have to do the night of the gathering is pop the fish in the oven for a short time. Smoked salmon is the star of this low-fat spread. It's a great choice for an appetizer, and because it's rich and filling, you'll be satisfied with a couple of tablespoons. Serve with whole grain crackers or bread to add a little more fiber to your day. You can't beat this quick weeknight dinner of Glazed Salmon with Couscous. It's table-ready in 25 minutes. Glazing the salmon before cooking keeps it moist; a second-coat later lets the sweet-tangy sauce shine. Get out of the beef rut and make your burgers with fresh salmon. Yes, that's right–fresh, not canned. The salmon is a great match for the cilantro and chipotle chile in the burger mixture. In addition to the good-for-you fish, the tropical mayonnaise has both mango and pineapple that contribute disease-fighting vitamin C.
Pink-fleshed salmon is beautifully contrasted by black Japonica rice in this healthy dinner for two. 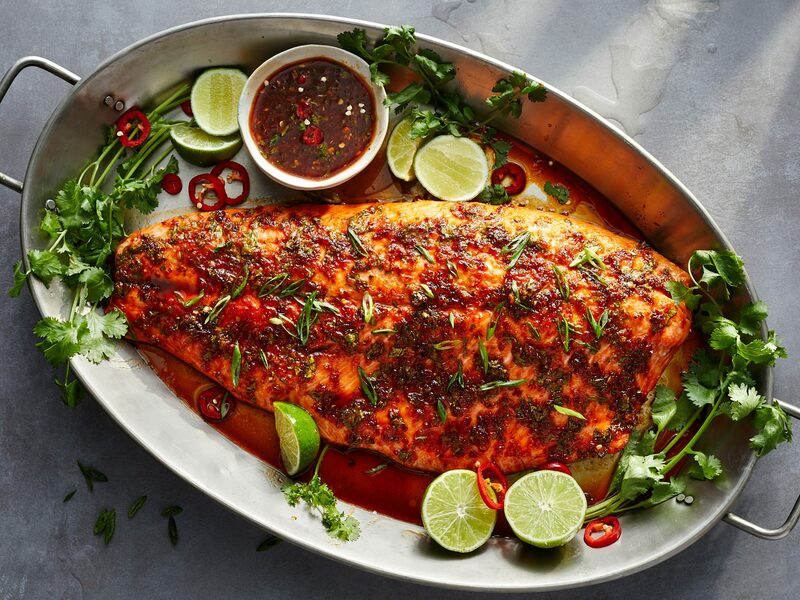 Indian spices such as cumin, coriander, ajowan and cardamom add exotic flavor to the salmon without adding any additional fat. The cubes of salmon are coated in an herbed yogurt mixture that's typical for tandoori dishes. This pink and green-hued meal features salmon fillets, grapefruit, cucumber, and watercress. In this healthy weeknight dinner, thyme and arugula keep the sweetness of the grapes in balance. Nearly all the cooking is done on a single baking sheet. The salmon comes off the grill juicy yet fragrant with smoke, a contrast to the creamy salad made with grilled and raw squash. Double the heart-healthy benefits of salmon by coating the fillets in almond meal. Almonds are a top source of vitamin E, a powerful antioxidant that helps fight against both heart disease, certain kinds of cancers, and certain eye diseases. Poaching is a simple, low-fat cooking method where you simmer the whole piece of food in a flavored liquid. It's a great way to add depths of flavor without adding fat. Here, the salmon is poached in a simple mixture of white wine, lemon, and herbs. 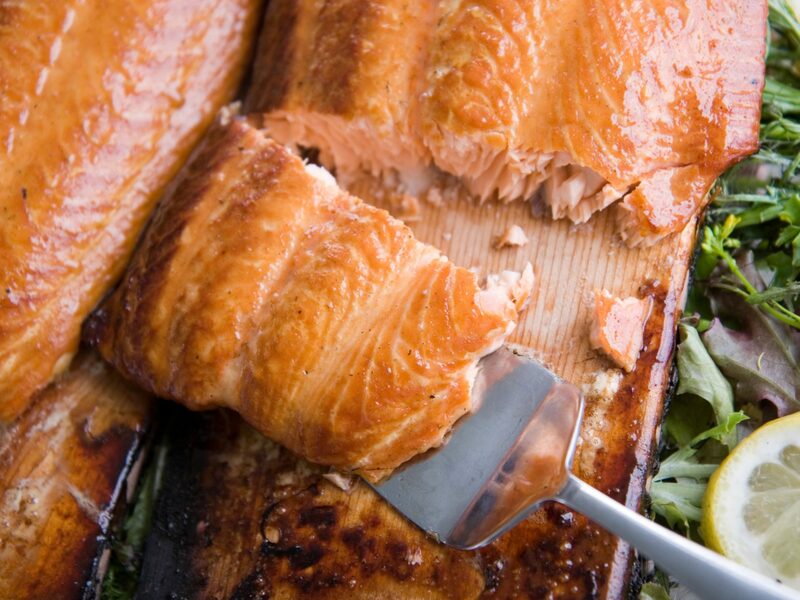 Wild salmon tends to have a stronger flavor and slightly less fat than farm-raised. Because of the assertive flavor of the fish, the only additional ingredients here are olive oil, salt, pepper, and a couple of mild herbs. 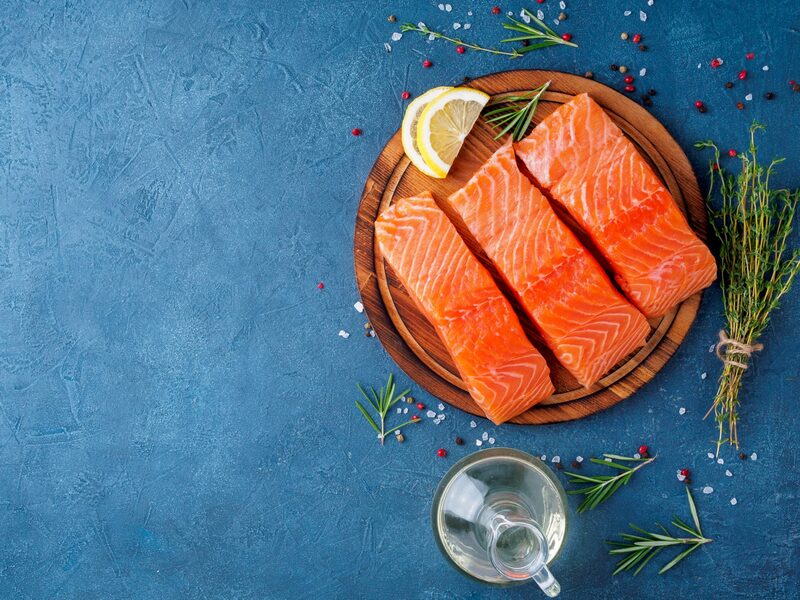 The peak season for wild salmon is April through October. Making croquettes is one of the best ways to use canned salmon, and canned salmon is a great source of calcium because of the soft bones that remain in the fish. If there were a healthy recipe hall of fame, this one would definitely be on the list. In addition to the salmon, it's full of other nutrient-packed foods such as spinach, red bell pepper, corn, bean sprouts, and sesame seeds. It's more than a salad–it's a meal. Beautiful and full of flavor, salmon doesn't need much more than a few simple ingredients to make it shine. It's a great fish for grilling because of its firm texture and high fat content. But don't worry–it's the healthy kind of fat.